THE BREXIT WITHDRAWAL deal has been defeated again in the House of Commons, with Prime Minister Theresa May suffering a thumping 149-vote loss. The result was 242 in favour and 391 against. MPs will now vote tomorrow on whether there’s support to leave the EU without a deal, with a further possible vote on Thursday on extending Article 50. This evening’s vote came in the wake of last-minute measures announced last night by May and European Commission President Jean-Claude Juncker. However, advice from attorney general Geoffrey Cox published this morning put the likelihood of the deal making it through the House tonight in jeopardy. Earlier, the DUP said its MPs would not back it, Tory Brexiteer group the ERG indicated it wouldn’t either and former foreign secretary Boris Johnson said leaving without a deal was now the safest route out of the EU. As the vote was taking place, it became clear that May was heading for a second major defeat on the withdrawal agreement. Earlier projections by Sky News had put the scale of the defeat at around 100 votes. In the end, that tally was short by several dozen. Speaking immediately after the vote, May told MPs that the government would now hold a debate and vote tomorrow on whether the UK should leave without a deal. A free vote will be allowed in the Conservative Party. She said she believed there was still a majority in the House that wished to leave with a deal, and that she would return to the Commons to begin the debate tomorrow. Information would be published on essential policies that would need to be in place for the UK to leave without a deal, including measures for the border, she said. Following tomorrow’s vote, it’s possible a motion will be put forward on Thursday offering MPs an option on whether they want an extension to Article 50. That will only happen in the event that tomorrow’s vote shows support for a deal. 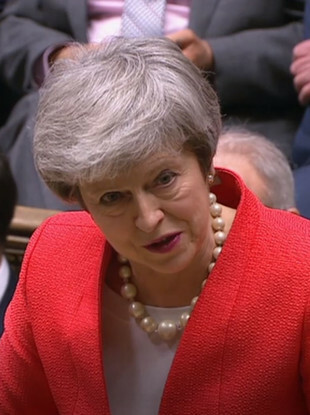 May said in her statement that if the House votes to leave without a deal on 29 March, “it will be the policy of the Government to implement that decision”. “If the House declines to approve leaving without a deal on 29 March, the Government will, following that vote, bring forward a motion on Thursday on whether Parliament wants to seek an extension to Article 50. “If the House votes for an extension, the Government will seek to agree that extension with the EU and bring forward the necessary legislation to change the exit date commensurate with that extension. “But let me be clear. Voting against leaving without a deal and for an extension does not solve the problems we face. The EU will want to know what use we mean to make of such an extension. Labour leader Jeremy Corbyn declared the Brexit deal “dead”, and called on the government to adopt his proposals for a softer Brexit. “Their deal, their proposal, the one the prime minister’s put is clearly dead,” Corbyn said. The EU, meanwhile, is standing firm on its position that negotiations on this deal are at an end. “The EU has done everything it can to help get the Withdrawal Agreement over the line. The impasse can only be solved in the UK. Our ‘no-deal’ preparations are now more important than ever before,” the union’s chief negotiator Michel Barnier said on Twitter. A spokesperson for President of the European Council Donald Tusk said that should the UK make a “reasoned request” for an extension, the remaining EU 27 would consider it and decide by unanimity. If MPs vote against a no-deal exit tomorrow, and vote to postpone Brexit on Thursday, the other 27 EU nations would need to agree. Their leaders will meet in Brussels for a summit on 21-22 March. But any postponement may have to be short-lived. Juncker on Monday said Brexit “should be complete before the European elections” at the end of May. The new EU parliament begins on the 1 July, meaning the latest possible date that they could extend Article 50 by, would be three months. Speaking to Sky News tonight, Belgian MEP Philippe Lamberts said he “doesn’t know what’s next”, adding that “a series of negative majorities does not produce a positive majority”. The EU can’t “suppress” the Good Friday Agreement, he said, adding that the idea of the EU agreeing to leave its border with Northern Ireland open, negatively impacting the valuable Single Market is “ludicrous”. We are not going to shoot ourselves in the two feet and cut off our two arms just to please some extremist Tory MPs. Sorry, that’s not how the EU works. Email “Theresa May’s ‘improved’ Brexit deal defeated by 149 votes - here’s what happens now”. Feedback on “Theresa May’s ‘improved’ Brexit deal defeated by 149 votes - here’s what happens now”.